The heart of the R34 NISMO Skyline GT-R Z-tune is a modified version of the RB26DETT engine called Z2, which produces 500 hp at 6,800 rpm and 399 lb-ft (540 Nm) at 5,200 rpm. All 20 engines are issued a serial number which will be used for data management in the future. 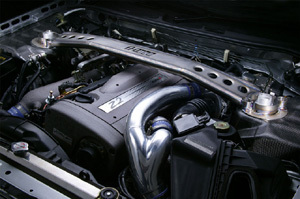 In order to produce these power figures, while attaining the high level of durability required of road-going cars, plenty of techniques and know-how that NISMO accumulated throughout its racing enganements have been lavishly adopted into the Z2 engine. Based on a race-prepared N1 engine block using an extended displacement of 2,771 cc, the Z2 uses an enlarged ball-bearing turbocharger made by IHI, derivatives of which have proven themselves in both the GT500 since 2001 and in the 2004 Nürburgring 24-Hour Endurance Race. A maximum boost of 1.5 bar can be maintained due to the the use of specially forged pistons with cooling channels and a long-stroke race-proven lightweight crankshaft. The catalyzer performance was improved and the pipe shape and diameter were optimized to effectively scrub and discharge the large volume of exhaust gas created by an expanded exhaust amount and high boost. The pipe is made of titanium (the front tube is made of stainless steel) to significantly reduce the weight. Twin air-cooled oil coolers were installed on the front side to achieve a stable oil temperature during high-speed driving. Thanks to these changes, the NISMO Skyline GT-R Z-Tune made the sprint from 0-60 mph in 4.0 seconds and the 0-400 meters (a little shorter than a quarter mile) in 10.06 seconds during development. That's more than 6/10 of a second faster than any production car ever tested at the time of its production. The R34 NISMO Skyline GT-R Z-Tune retains the ATTESA-ETS all-wheel-drive system of the R34 GT-R and the latter's 6-speed manual transmission. The clutch is a specially developed item that uses a high-friction material made from an optimum blend of copper in the disc to reduce the friction and deformation caused by heat and to suppress judder, which occurs easily in clutches made of metal. Using a disc made of high-friction material makes it possible to lower the clutch cover pressing force and thus reduces the clutch pedal depression force. This emphasizes that this vehicle is a road-going car and not a racing car. For reduced weight, the propeller shaft is made of CFRP. The transmission and differential oil temperatures during continuous high-speed driving were optimized by installing a special oil cooler. For improved handling, the R34 NISMO Skyline GT-R Z-Tune features special Sachs dampers with 3-way adjustments derived from the GT500 racecar. 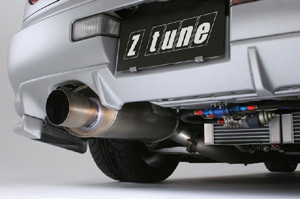 Z-tune-specific Sachs coil-overs are three-way adjustable to handle any number of track and street setups. The 782 lb/in. springs, however, are an indicator that supercar handling comes with a supercar ride. This brake system was developed with Italian manufacturer Brembo for a target performance of 1.6 G when mounted with S tires. 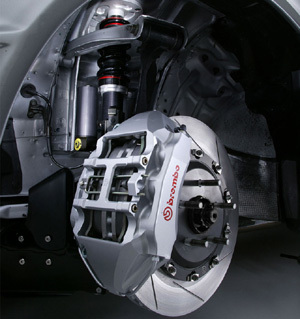 It features mono-block 6-piston calipers with 14.4 in. (365 mm) 2-piece KIRYU brake rotors in front and 6-piston calipers with 14.0 in. (355 mm) one-piece KIRYU brake rotors in the rear. The ABS unit was specially tuned to further utilize the performance of these high-performance parts. The ATTESA ET-S and active L.S.D. were specially tuned to accompany the increase in engine power in order to make the torque distribution to the front more suitable and to improve the rear differential effectiveness. R34 NISMO Skyline GT-R Z-tune rides on black LM GT4 "GT500 Model" lightweight forged aluminum wheels that were jointly developed with RAYS. This is a wheel with the same rim shape and color as used for GT500 race vehicles. For driving on public roads, specifically developed Bridgestone POTENZA REO1R 265/35 R18 are used, while POTENZA RE55S 265/35 R18 can be fitted for sports driving on closed circuits.